The value of a Queen Victoria - ½ cent 1898 stamp depends on several factors such as quality and wear, supply and demand, rarity, finish and more. Values in the section are based on the market, trends, auctions and recognized books, publications and catalogs. This section also includes information on errors and varieties and characteristics. 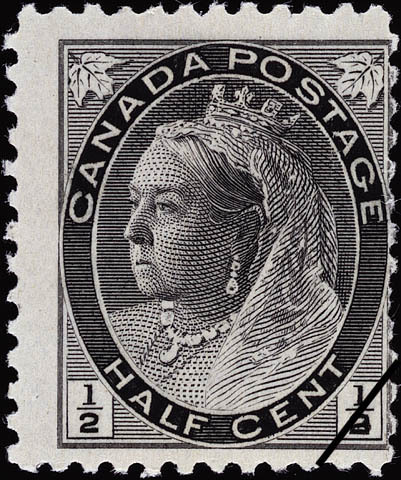 The decorative and symbolic use of the maple leaves on the Diamond Jubilee commemorative and the regular issues of 1897 met with instant public approval. But the designers of the Maple Leaves issue failed to give sufficient prominence to the denominations in words rather than figures. As a result, the public was not able to distinguish the face values quickly. The Post Office Department accordingly modified the design and prepared a new issue of postage stamps.